Over the past year, Pale Waves have set themselves up as the UK’s premier makers of heartbreak pop. As they prepare to unleash their debut album ‘My Mind Makes Noises’, Thomas Smith meets them in the spiritual home state of the lovelorn teen movie, Illinois, to hear about how their passion for each other translates to their music – and why Heather Baron-Gracie would die for her bandmates. We’re in Pale Waves’ dressing room and there’s powder absolutely everywhere. Talcum powder. The band are applying it to minimise sweating in the blistering 35° heat that’s currently cooking Lollapalooza Festival in Chicago – the earth in the city’s Grant Park is scorched. Talc is on the walls, all over our trousers and even in our drinks, too. Lead singer Heather Baron-Gracie warned us this might happen when we stepped off their tour bus earlier in the day: “This weather’s not made for goths,” she deadpans. Summer is, of course, not the easiest season for a goth, but not least if you’re playing the first set of their two shows today right in the middle of the afternoon. Making a debut appearance at the festival ahead of debut album, ‘My Mind Make Noises’, out on September 14, they’re one of the most talked-about new acts on the bill and they draw a bulging crowd – some fans climb halfway up a tree to get a decent vantage point. Their set – impeccable, as theirs always are – matches future pop anthems with synchronized hair flicks and dance moves. Over the course of a year, it’s become a slick and sharp live experience that’s seen them win over thousands of fans, not least here in the US, which is a fitting place to join the band. 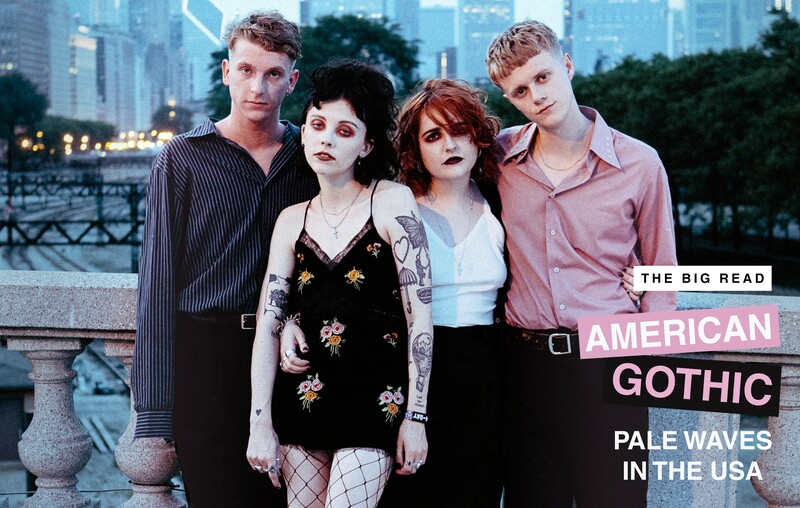 Pale Waves came together in and around Manchester and the North West, but there’s something about America that seems to chime with this lot. 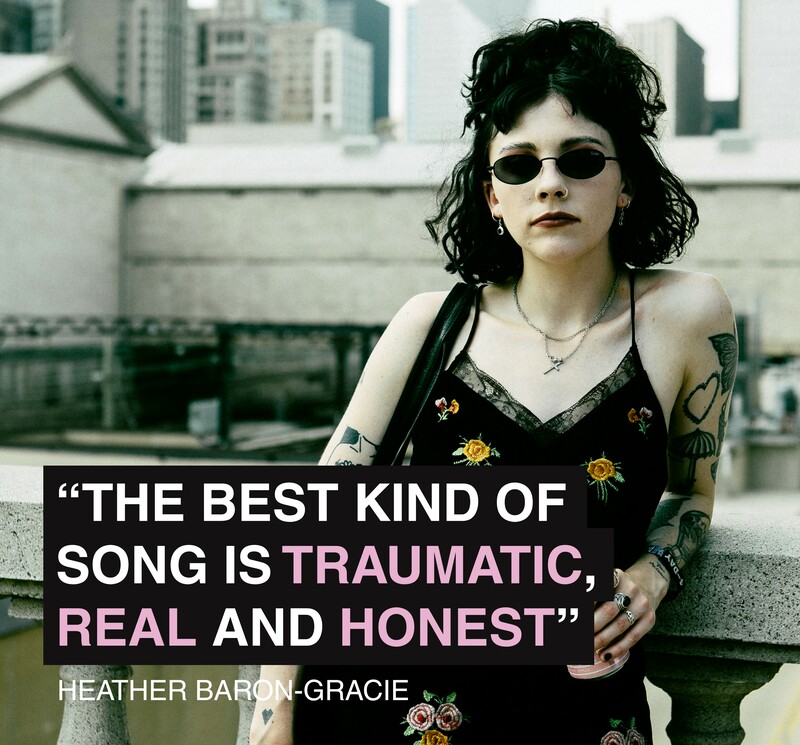 Last year, they supported Dirty Hit label mates The 1975 at New York’s Madison Square Garden, despite having just one song out in the world, the nectar-sweet pop of ‘There’s A Honey’. It was also on this side of the Atlantic, at 2018’s South By Southwest festival, that the band were on the lips of everyone who wanted to be in the know. As we walk across the site post-set, Heather nor the rest of the band can make it further than a hundred yards without being asked for pictures by fans. Meanwhile, frat-bros are trying to work out who the hell these pasty goths think they are. For the pop kids in America, Pale Waves seem to have touched a nerve, and perhaps that’s because ‘My Mind Makes Noises’ feels like an American record, tapping into the USA’s grand narratives of love, hope and opportunity. And so the Pale Waves story goes: Heather and drummer Ciara Donan met at music college BIMM Manchester in 2014. From there, a powerful bond was formed. The pair would talk about life and music, and a shared love of Bon Iver and The Cure. “I was so intrigued by Ciara, not as a musician but as a person. Meeting her was like yin and yang. I’ve never clicked with anyone in my life as well as I have with her.” The tattoos they each have of the other’s name confirms this union is much more than skin deep. While Heather is the emotional, outspoken lead singer of the band – its Ciara who acts as the steady driving force behind it. 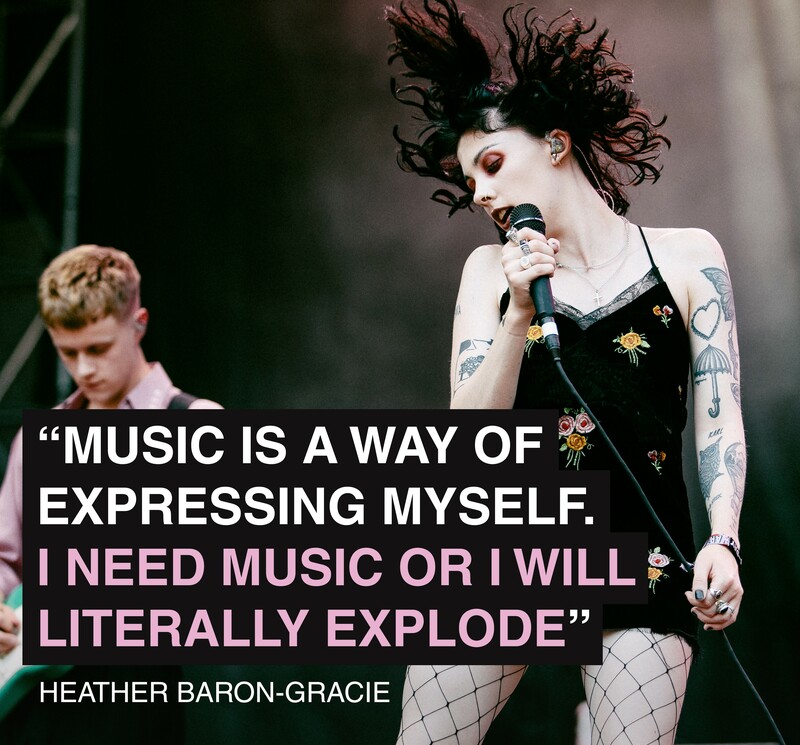 Over their time together, she’s assumed the role of Pale Waves’ level headed technical guru – translating the big ideas into tangible products and offering support to the rest of the band. “There is no one in this world that I would trust more than Ciara: not even my mum, my dad or my brother. She’s at the top,” says Heather. Bassist Charlie Wood and guitarist Hugo Silvani would join the gang before Pale Waves signed to Dirty Hit in 2017. Heather says Charlie provides “classic bassist” comic relief, while Hugo has been instrumental in shaping the pulsating live show. They are definitely the real thing. With every song on the album, you’re dragged along for the journey – from being in the back of the cab listening to their songs on the radio (‘Karl’) to “crying outside” a lovers house (‘Black’) – you live through their tumultuous, but often life-affirming love affairs. “Sometimes I feel like I’m gonna die alone because I’m such a particular person,” she sighs. ‘Noises’, the song from which the album takes its name from, is proof of this need to express. “Why do I stare so much at my body? I’m falling, I’m crawling on the floor at night/I know it’s not right, but you can’t fix me this time” Heather sings over a juddering pop beat. “The amount of feedback we got after putting that song out as unbelievable. That is a song that is going to play such a big part in so many people’s lives,” she says. Using music as therapy is tough as a performer but for every inspired teenager that’s reached out, there’s a troll lurking ready to ignore the message and leave bile in the comment sections. “Some of them are really bad, and can be really sexually obsessive of me. You can come up to me and say whatever and I’ll give it back, but the fact that you might do that to other women scares me,” she says. Not that there should be a choice, but “I’ll take the hit out for everyone; offend me rather than Ciara, Hugo and Charlie. I am ready to fight”. This is not the Pale Waves we’ve come to know. There’s a defiant streak there, for sure, but ‘My Mind Makes Noises’ and everything else that came before hints at them being very much lovers, not fighters. By our count, Heather sings about kissing 15 times on this album. Its that side that resonates with their fanbase and has cultivated a young, progressive one as a result. “We accept anyone to come in our community and feel safe and welcome,” Heather says. It is, I suggest, some of the same progressive qualities people see in their label-mates and mentors, The 1975. This isn’t the first time or last time that band will be brought up in an interview with Pale Waves. They’re very much aware of the role that the 1975 played. Their debut single, ‘There’s A Honey’, was produced by its frontman Matty Healy in January 2017, and Heather says that follow-up ‘Television Romance’ was recorded in Matty’s attic. In October 2017, Heather and Matty appeared on the cover of NME together and he was singing their praises. “There’s a naivety and a purity to them and an honesty to them that kind of comes through in their music,” Matty told us. Pale Waves’ story isn’t defined by another band, but rather emboldened by it and that’s the way they see it. “It would tire me out talking about them so much, but I understand why people did that. I know we only get compared to them so much because they’re just so relevant,” Heather says. Pale Waves did well out of it – a co-sign from one of the planet’s biggest pop bands, for one – but their relationship is, and continues to be, mutually beneficial. “It felt like he could express himself as a producer in a way that he couldn’t with The 75,” Heather says of his work on early singles ‘There’s a Honey’ and Television Romance’. “But we’re different bands and different people. They are our friends, and we’re really close to them but we’re both doing our own thing right now”. The 1975 are gearing up to release their next album ‘A Brief Inquiry Into Online Relationships’ by the end of November, with follow-up ‘Notes On A Conditional Form’ poised to join it in Spring next year. There’s a similar ‘crash, bang, wallop’ approach being planned by Pale Waves, too. “I have no idea when the next album is coming out, but hopefully there’ll be an EP soon. We’re actually going to go a lot more pop punk and rock’n’roll. Ciara and I have started writing a new EP and it is completely different to the album.” Different how, I ask? Respectfully, there’s a tried-and-tested formula to much of their music. More political, for one, says Heather. “We are a very political people and we have view of things,” Heather responds. “The next body of work we’ll be releasing dives into that world more. In the sense of accepting who you are with sexuality and your views on life. We didn’t want to go super political, as I don’t know if it’s our time to do that, but definitely expressing our views to do that”. Still the feel the same? As the evening draws in, I travel with the band to their second show of the day – a festival aftershow at Concorde Music Hall. As the 10pm stage time approaches, the band get into all kind of hijinks. First there’s a stop off at Devil Dawgs – home to the city’s most infamous Chilli Dogs – then the band takes turn to do pull-ups on a my-god-that’s-really-wobbly piece of scaffolding on the street, egging each other on to do more. When they get to the venue they ransack the rider and get the speakers blaring – first hip-hop stars like Travis Scott and Tory Lanez get an airing, then they blare out ‘Red’ from their debut album. Loaded with prosecco, the group and their entourage begin dancing around the room to one of their best songs and invite me to join in. It’s a joyous moment. It’s during the heady moments that it becomes clear that maybe we need bands like Pale Waves just as much as the hyper-political artists we adorn now. Idles, Childish Gambino and more already tackle society’s issues on a macro and micro level. Why can’t there be a space for a bunch of kids writing about falling in and out of love? They succinctly vocalise the experience of being young, naive and reckless but also envisioning a better world through their own prism. “Life moves pretty fast. If you don’t stop and look around once in a while, you could miss it,” said Chicago’s most mischievous son, Ferris Bueller, in the 1986 film Ferris Bueller’s Day Off. But having spent 24 hours bouncing around The Windy City in the company with the years’ most exciting young band – it’s abundantly clear they’ve got their eyes on the biggest prizes. They won’t miss a single thing.